I am thrilled to speak on the topic of Your Client at this years Creative Founders Conference. While there are a number of strategic steps to help you create a loyal league (all of which I am sharing during the conference) today, I want to share one strategy that you can begin to apply today to help you transform the way that you communicate with your audience and client. This one shift in your conversation, in your copy, in the way that you market and speak to your customer moves you from just a business offering widgets to a brand that can speak to the heart of your customer. Trust me, this makes all the difference in creating lasting relationships, in standing apart from the crowd and being remarkable in the marketplace. 1. What problem/need/desire do you solve/meet for your audience? 2. Why is finding a solution or having this desire/need met important to your audience? How does it affect their business or life? 3. What would life look like for your customer if they were to utilize your product or service successfully? I would love to hear your answers to these questions in the comments! Remember, the key is to take your eyes off of wanting to meet a need in your business and focus on meeting the need of your customer. Once you do that, you and your business needs will be taken care of! 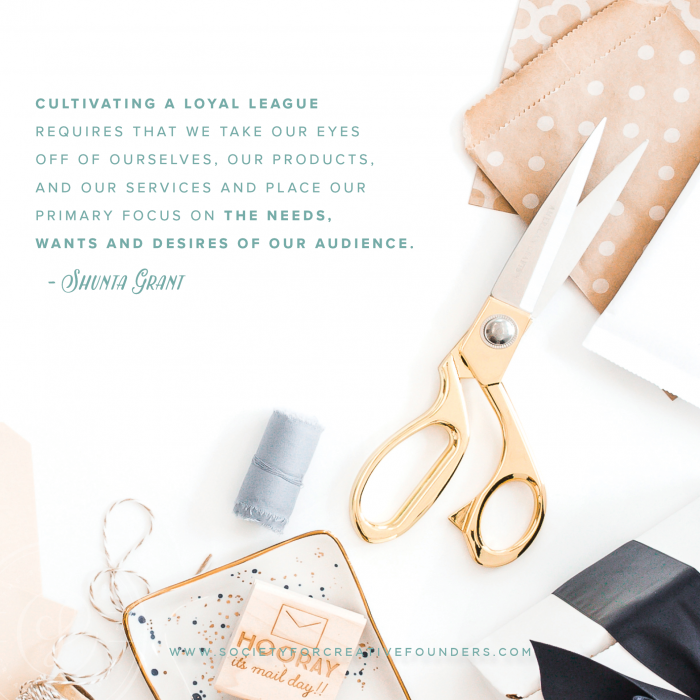 Your customer is at the center of your business and once you start there with all that you do and say, you are well on your way to creating members of your very own loyal league! Join me at the Creative Founders Conference this April and let’s talk about how you can develop this loyal league within your business. I’ll be looking for you!